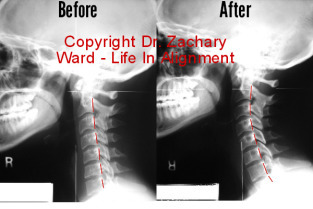 Hi, this is Dr. Zachary ward at Life In Alignment Chiropractic here in Auburn Hills, Michigan. We’re looking at patient number six: a bone spur leading to chronic neck pain….Big question mark on that one. Let’s go ahead and take a look. Did a bone spur on her CT scan actually cause her neck pain? We’re looking at that MRI of her from the side. This is a slice down of her right through her middle. You’re seeing a lot of degeneration right here in the middle of the neck, and specifically right here, you might want to pause and kind of zoom in on this. This is a bone spur right there on vertebra – two, three, four, the back between five and six. And you know probably the disc is obliterated, and this is all just collapsing right there. Now just because someone has a really big bone spur on an MRI doesn’t mean that it explains all of their pain. So we look at a reconstruction of her neck via CT scan, and what we’re gonna see here, and this is her right side and this is her left side, is a large forward displacement of her second cervical vertebrae on her third cervical vertebra. There’s a joint what we call this uncinate joint. And there’s also a little bit of one right there. We’re gonna look at another view of that, and this is the same neck, this time from the front. The nose is up here and from behind, here’s the back of the skull. And you’re looking at this kind of curve and lean of the neck, and there’s just huge gap right here on this joint. And there’s a lot of stretch of these ligaments in this area, and a lot of stretch of these ligaments over here. And there’s so much stress on this joint, in fact, that there’s starting to be spreading out and joint degeneration on this side. And what we found was eleasing this joint up in here, through he process that we use, the chronic neck pain went away. So I’ll say that again: four years of chronic neck pain that was eventually blamed on a bone spur went away once the neck was properly released. I am Dr. Zachary Ward at Life In Alignment Chiropractic. You can find me at LIAChiro.com. If you have any questions about this case, or any other case, we are way over one minute now, you can find me at LIAChiro.com/contact, or call me if you’re in the Metro Detroit area: 248-598-4002. Thank you so much for watching and listening. And go back and pause and look at some of those images again. Have a great day! Check out the other videos in this series ten patients in ten minutes.